Chicago writer Achy Obejas interviews Yiyun Li about her life work and the inspiration behind the intimate stories in Gold boy, emerald girl. Achy Obejas reads from Ruins. Achy Obejas , This Is What Happened in Our Other Life. MARK DOTY discusses Fire to Fire: New and Selected Poems. ; ACHY OBEJAS discusses Ruins. (NOTE: Tickets $5.00 EA / FREE for Educators & Students) DESCRIPTION: Lambda Literary Award–winning authors Doty and Obejas will read from and discuss their latest work. Doty, the celebrated poet and memoirist, has written movingly on love and loss in modern gay life. Obejas, an esteemed Chicago-based journalist, novelist, and translator, writes about the tension between public identity and private experience in the United States and her native Cuba. Both will address the question: how do writers grapple with questions of social, political, and cultural resonance surrounding the LGBTQ experience? C. C. Carter, Lambda Literary Finalist for Best Lesbian Poetry and director of community and culture for the Center on Halsted, will moderate. Achy Obejas was born in Havana, Cuba, and emigrated with her parents to the USA at age six, after after the Cuban revolution. She grew up in Michigan City, Indiana, and attended Indiana University. In 1979, she moved to Chicago, where she worked for the Chicago Sun-Times and the Chicago Reader. She has also written for The Windy City Times, The Advocate, High Performance, and The Village Voice. 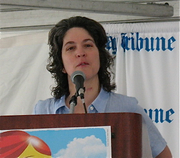 She became a cultural writer for the Chicago Tribune in 1991. She has also been a freelance entertainment writer. Her poetry has appeared in a number of journals, including Conditions, Revista Chicano-Rique, and The Beloit Poetry Journal. Her short stories have also been widely published in journals and anthologies. Her novels include We Came All the Way from Cuba So You Could Dress Like This? (1994) and Memory Mambo (1996). The Cuba of her imagination has appeared throughout her works, and she revisited Cuba at age 39. She has served as a writer-in-residence at Yaddo, Ragdale, the Virginia Center for the Arts, and the University of Hawaii. She is the Sor Juana visiting writer at DePaul University, a position she has held since 2006. She also writes a blog called Citylife: Adventures in Urban Living for Chicago Public Media. Achy Obejas's book We Wear the Mask: 15 True Stories of Passing in America was available from LibraryThing Early Reviewers. Achy Obejas's book The Tower of the Antilles was available from LibraryThing Early Reviewers. Achy Obejas's book Memory Mambo was available from LibraryThing Member Giveaway. Achy Obejas is currently considered a "single author." If one or more works are by a distinct, homonymous authors, go ahead and split the author. Achy Obejas is composed of 2 names. You can examine and separate out names.